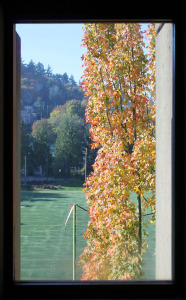 An autumn view from the Library’s 5th Floor. The Library will be closed Thursday, November 27 and Friday, November 28 for the Thanksgiving holiday. We are open regular hours all other days. The Library will be open 24 hours from Monday, December 1 at 7:30am through Thursday, December 11 at midnight. See Library Hours for more information.